Nexus by Mark Buchanan | Blah! By now, everyone has heard about the six-degrees of separation thing, how we are all connected to Kevin Bacon by about 6 other people. Turns out, there is nothing special about Kevin Bacon — each of us is connected to pretty much everyone in the world by about 6 or 10 other people. In a world with 6 billion people, how can this be possible? That is where the theories of complex networks and, in particular, small world networks come in. In Nexus, Mark Buchanan gives an introduction to this new field (many of the seminal discoveries have occurred within the last decade). He describes how these networks are ubiquitous in nature (e.g. the networks of streams comprising a river system), social networks (the 6-degrees thing, among others) and networks created by humans (the internet and the electricity grid, as two examples). It turns out that there are two types of small world networks, called egalitarian and aristocratic. Buchanan discusses how such networks arise naturally. In particular, the aristocratic networks, characterized by special nodes that have an especially high number of links to other nodes, occur via a “rich get richer” process, in which nodes that already have a lot of links or friends or what have you are more likely to get even more. There were a number of intriguing points in this book. For example, when he discusses river systems, it turns out that all river systems follow the same distribution of land they drain versus the number of streams in the river system that drain that amount of land. They follow a power law distribution. That is, if 100 streams in a given river system each drain 50 square miles of land, then 50 streams will drain some constant times 50, and 25 streams will drain that constant times that constant times 50. There is a power law association between the number of streams that drain a given area of land and the size of that area. Even more interesting, just assuming the most simplest of assumptions, this distribution can be generated in a computer. All they assume, given a random topology of land (not even a real landscape), is that water flows straight down hill. They neglect so many seemingly important features (erosion, for example) that it seems impossible that it would represent anything about real river systems. But, it does. Another feature that has such a power law distribution is the amount of wealth held by a given percentage of the population. Known as the Pareto principle, it basically is the observation that in most countries in the world, regardless of type of government or economy, about 80% of the wealth is owned by 20% of the people. And, as you look at the number of people who own 90% of the wealth, it is a constant factor of 20%, and so on. This, to me, is amazing. Furthermore, again in simple computer experiments in which you allow people to exchange wealth in one of two ways — they can either (a) buy something from someone else, involving direct transfer of wealth, or (b) they can invest their money with some random rate of return — this Pareto distribution is reproduced. This is true even if you assume that all players have the same skill in investing. It all comes down to random luck and the rich get richer principle. As someone gets lucky and wins on their investment, they in turn have more money to invest. Think about the implications: the distribution of wealth in most countries might be mostly due to random luck. Sure, government policy (e.g. taxes, etc) would change the slope of the distribution, or the power in the power law, and skill might as well, but that this distribution can be obtained without any of that suggests that the wealthy are wealthy not because they worked harder or were smarter or anything like that, it is just pure random luck. If this is true, what does that mean about how we view the wealthy’s role in society? This book had a number of intriguing points such as this that really make you look at the world in a different way. These small world networks are so pervasive (they even occur in the sexual relationships of people — there are some people who have so many sexual partners that they essentially connect everyone within a few links of one another; this has implications on how you might treat, e.g., sexually transmitted diseases) that understanding how they come about and what they teach us about how the world works is absolutely essential. Knowing that we are all connected so intimately and what that means for how we interact is fascinating. I highly recommend this book to anyone who is interested in how people, atoms, computers, rivers — so many different things — interact with one another. 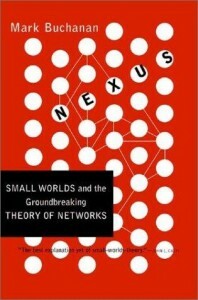 For more information about small world networks, see this Wikipedia article. Pingback: Poker and the Pareto Principle « Blah!